Somewhere in another dimension there’s a place where fantastic animals and magic abilities are commonplace and we could describe this place as a Fantasy Realm. Fortunately that’s also the name of this online slot, originally developed by Cryptologic and now part of the giant Amaya Gaming organisation. Oddly, it also includes the Movie Mayhem progressive jackpot which is very welcome but doesn’t quite fit in the theme. 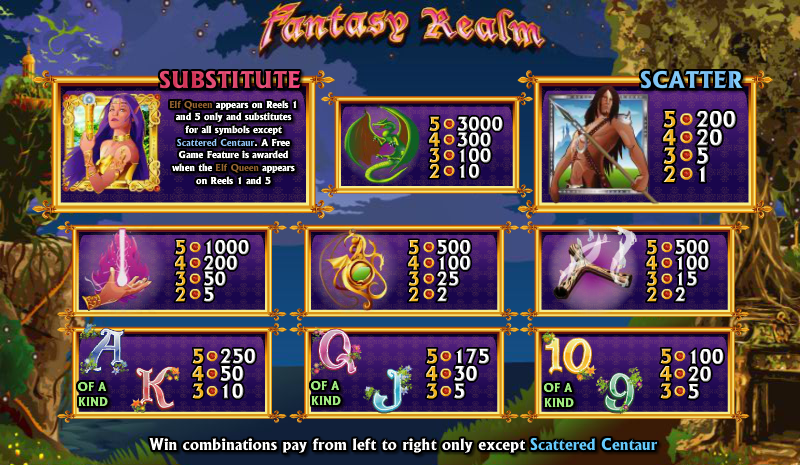 Fantasy Realm is a five reel slot with three rows and up to twenty five paylines; there’s a nicely-drawn backdrop to the reels featuring rolling forested hills, vine-covered trees and overgrown temples. The high value symbols include a small, green dragon, a magical hand, a a golden ornament and a burning log; lower values are represented by the standard 9, 10, J, Q, K and A. The Elf Queen symbols is wild, only appears on reels one and five and she will substitute for all others except the scatter – that’s represented by a dark-haired warrior. 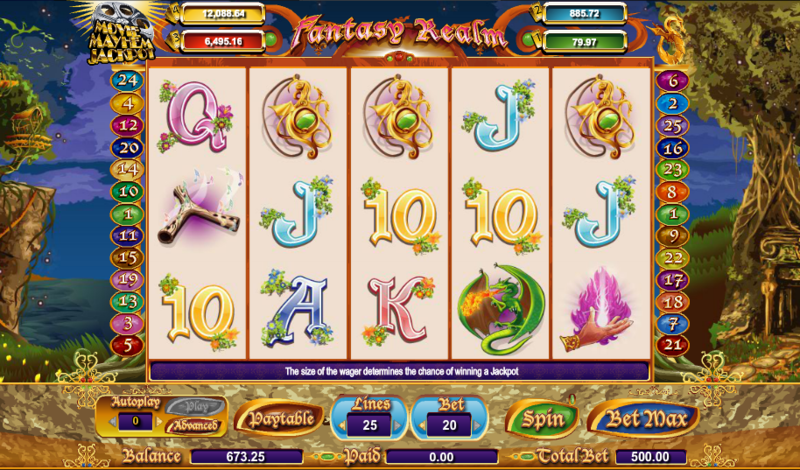 Not only is the Elf Queen the wild symbol but she will also trigger the free spins if you can land her on reels one and five on the same spin. Manage this and you will earn yourself a generous twenty five free spins with a 2x multiplier for any wins. Landing the Elf Queen on reels one and five during this round will trigger more spins. Above the reels you will notice four boxes containing four jackpots of varying sizes. The game which could win you a jackpot is triggered randomly although the larger your bet, the better your chances. You will get to play a picking game and you job is to find movie tickets – the number you collect determines which jackpot you will win (four for the top prize). We like the looks and design of Fantasy Realm, even if it comes across as a little dated now. The free spins round seems quite profitable and the addition of the progressive jackpot is certainly welcome. The RTP is 93.91%.